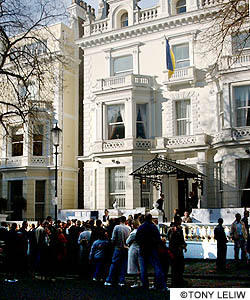 Ukrainians wait patiently in line to vote outside the Embassy in London. Ukrainians in Britain have backed Viktor Yushchenko by a massive 89.85% in Sunday's presidential elections. They polled 788 votes for Yushchenko, 41 votes (4.68%) for Viktor Yanukovich, while Sergei Komissarenko, Ukraine's first ambassador to Britain following independence got a paltry 9 votes (1.03%). Of the 1,642 registered voters, 877 actually voted. 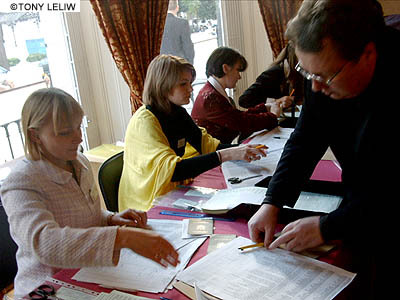 Ukraine's current ambassador to Britain, Ihor O Mitiukov, was pleased with the day's proceedings and said he was aware of the various difficulties which had perhaps prevented more people from coming to vote. Mr Mitiukov was Minister of Finance for Ukraine between 1997-2001, during which time there were two prime-ministers - Pustovoitenko and Yushchenko. Although he was not prepared to say who he voted for, Mr Mitiukov did not rule out the possibility that perhaps in the future he might once again serve in a Yushchenko government. Among voters who were more candid over who they voted for were Oleksandr Pochkun, a 22-year-old student from Sumy in Eastern Ukraine, who voted for Yushchenko. "I'm expecting him to win, otherwise I wouldn't have come here," he said. Studying here for a year and a half, Mr Pochkun said that only one of his friends had come to vote. Many Ukrainians who were here illegally were not aware that they could still vote, even if their visas had expired. Oksana Kuzmenko, a 37-year-old pharmacist on holiday with her husband Anatoliy from Cherkassy, said: "I voted for Yushchenko because he is the only politician who can do something for Ukraine. Although a lot of people will vote for him I fear that the elections will be falsified," she said. Bohdan Shkarupa, a 32-year-old accountant from Vynnitsyia, also voted for Yushchenko. He also feared the election would be rigged. "The USA will not recognise it and there will be more elections," he added. Taras Chaban, co-ordinator of Polling Stations Abroad (UK branch), which monitored the elections and helped count the votes, said he was confident that more people would register for the final poll on November 21. 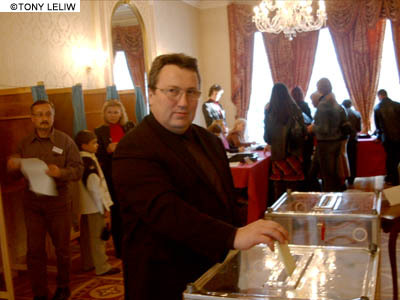 Getting the ballot paper to vote - Ukrainian ambassador to Britain, Ihor O Mitiukov. Ambassador Ihor O Mitiukov casts his votes in the opulent surroundings of his Embassy. 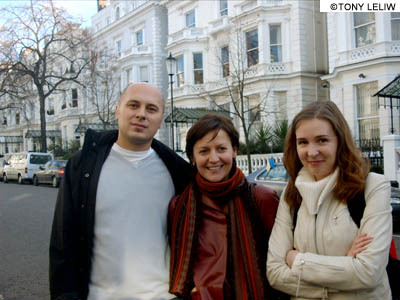 Oksana Kuzmenko and her husband Anatoliy from Cherkassy take a break from their holiday in England to vote for presidential candidate Viktor Yushchenko. Bohdan Shkarupa, a 32-year-old accountant from Vinnytsia, votes for Yushchenko.